The Save as command displays the “Save Image” dialog. Since GIMP-2.8, the file is automatically saved in the XCF format and you can't save in another file format (for this, you have to export the file). The Save as dialog allows you to save with another name and/or to another folder. or by using the keyboard shortcut Shift+Ctrl+S. The left panel is divided into two parts. The upper part lists your main directories and your storage devices; you cannot modify this list. The lower part lists your bookmarks; you can add or remove bookmarks. To add a bookmark, select a directory or a file in the middle panel and click on the Add button at the bottom of the left panel. You can also use the Add to bookmarks command in the context menu, which you get by clicking the right mouse button. You can delete a bookmark by selecting it and clicking on the Remove button. 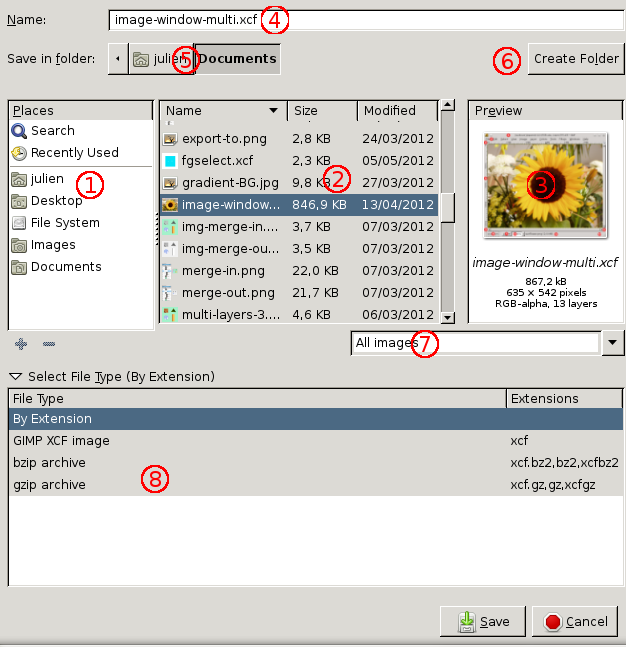 The middle panel displays a list of the files in the current directory. Change your current directory by double left-clicking on a directory in this panel. Select a file with a single left click. You can then save to the file you have selected by clicking on the Save button. Note that a double left click saves the file directly. You can right click on the middle panel to access the Show Hidden Files command. The selected image is displayed in the Preview window. File size, resolution and image composition are displayed below the preview window. If your image has been modified by another program, click on the preview to update it. Enter the filename of the new image file here. If the image has already been saved, GIMP suggests the same filename to you. If you click on Save, the file is overwritten. Above the middle panel, the path of the current directory is displayed. You can navigate along this path by clicking on one of the buttons. If you want to save the image into a folder that doesn't yet exist, you can create it by clicking on Create Folder and following the instructions. This button shows All Images by default. This means that all images will be displayed in the middle panel, whatever their file type. By developing this list, you can choose to show only one type of file. At Select File Type, you can select a compressed format for your XCF file.